To read this article in full, click on the title above and then click the link below the picture to view the full magazine (pdf format). 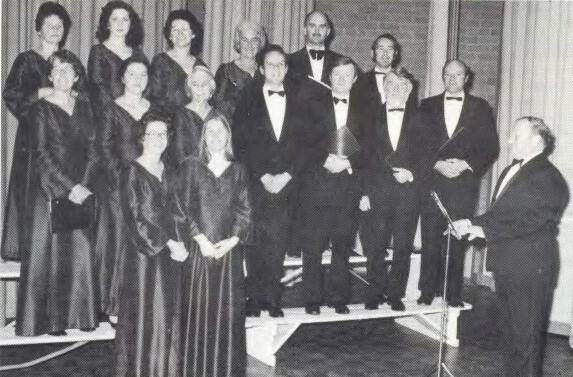 This photograph of the Yallourn Madrigals was taken in 1976; and it is an important image, in terms of the history of Yallourn, as it places on record the names of the members of the choir at that time. From the left in the back row: Gwynne Elliott, Linda Hibbert, Ruth Hibbert, Dorothy Cairns, Colin Harvey, Kenneth White, Nancy Embleton, Lois Kemp, Elsie Maddern, Richard Gubbins, David Cousins, John Brown, Bill Adams, Faye Waterson, Sue Bailey and Franz Onger is the conductor.